France in London | Max et Mathilde arrive from France! Max et Mathilde arrive from France! Parlez-vous français? If so, you’re in the minority. A recent survey carried out by the European Commission revealed that 2 out of 3 Britons are unable to speak a foreign language. But help is on hand in the shape of Max et Mathilde, who aim to get the nation’s children speaking French! On September 26th, to celebrate European Day of Languages, Blue Giraffe Press will launch a new series of picture books to introduce French to young children age 3-8. The Max et Mathilde books are simple, easy-to-use and, above all, fun! Complete with an audio CD to model pronunciation, the books encourage children to view learning French as an enjoyable, everyday activity. 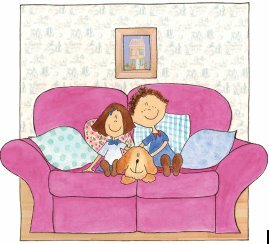 The launch books - Colours and Days of the Week, priced £8.99 - immerse children in Max et Mathilde’s busy lives with familiar, manageable themes and reassuringly simple vocabulary. The language methodology has been tested with groups of children, parents and teachers to find out what really works. The result is a three-tier system – single word, simple phrase and more extended dialogue. A translation appears at the back of the book to encourage children to predict words from the pictures, avoiding them becoming stuck on word-for-word translation. To celebrate their arrival, and to emphasize the fun aspect of language learning, retailers throughout the UK will host a series of in-store events. Children will be invited to join in with games, chanting and singing – all in French! Blue Giraffe Press is linking with Maison Blanc who sell a range of authentically French breads and pâtisserie and Petit Bateau, retailers of delightful French cotton clothing. Both will host in-store sessions. Booksellers Ottakars and Borders are also joining in the fun and games and will host a number of events in bookstores throughout the UK. But we thought the last word should go to Max et Mathilde themselves: “Apprendre le français dès le plus jeune âge est une très bonne idée! An introduction to French with charming characters Max et Mathilde. Children can learn their colours and simple phrases whilst enjoying the beautiful illustrations. A unique three- tier language methodology – word, simple sentence or higher level dialogue allows for broad accessibility to French. Tested with children, parents and teachers. Max et Mathilde themselves feature on the accompanying audio CD with opportunities for repetition and singing. 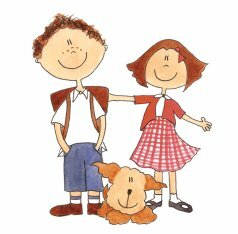 An introduction to French with charming characters Max et Mathilde. Children can learn the days of the week and simple phrases whilst enjoying the beautiful illustrations. A unique three- tier language methodology – word, simple sentence or higher level dialogue allows for broad accessibility to French.